Hikaru Sulu was born in San Francisco, Earth on 2237. In 2248, Sulu and his family moved from Earth to Ishikawa, on the planet Ganjitsu, located along the Federation-Klingon border. An unexpected Klingon force attacked the colony they lived at. This resulted in the death of a girl Sulu was close friends with. Only many years later, did he finally release this consuming guilt he had harbored. Sulu was a sciences division officer serving aboard the USS Enterprise in 2265, under the command of Captain James T. Kirk. He was the department head of the Astrosciences Department. A year later, in 2266, Lieutenant Sulu was a command division officer on the Enterprise. He was one of the ship's helmsmen. 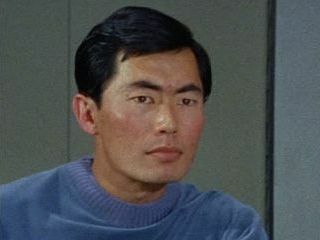 In 2266, Sulu and the then Chief Navigator Lieutenant Kevin Riley came under the effects of the Psi 2000 polywater intoxication after being exposed while they both tried to prevent science division Lieutenant junior grade Joe Tormolen from stabbing himself with a table knife in the recreation room. A bit later, Sulu left his helm post to go practice fencing. Unfortunately the intoxication just built into him to the point where he started fancying himself as the reincarnation of D'Artagnan, imperiling crew members in the corridors with a fencing foil. This got so out of hand that he went back to the bridge that he assumed and needed to confront Kirk as Richelieu. Sulu even took Uhura under his "protection" as a "fair maiden". (Uhura told him, "Sorry, neither" and was able to break free of Sulu's grasp.) Then Spock subdued Sulu with a Vulcan nerve pinch and Sulu was taken by two crewmen to sickbay. The majority of the rest of the crew became infected with the polywater intoxication until McCoy found an antidote to the intoxication, which worked on Sulu and he returned to duty. At one point in 2266, Sulu announced contact with an object approaching the Enterprise at light speed. He later attended a department heads meeting in the briefing room, where they discussed the finding. A short time after the Enterprise destroyed that object, Sulu announced that a new, larger object (about a mile in diameter) was approaching. He subsequently had to carry out several orders that Kirk issued to then-navigator Dave Bailey, as Bailey was so shocked by the alien presence he wasn't responsive to commands. A short while thereafter, Sulu counted down the minutes to a threatened destruction of the Enterprise, a bluffed threat posed by the commander of the second object, which was actually the First Federation starship Fesarius, under the command of an alien named Balok. Sulu ultimately witnessed the departure of the first of several navigators to leave after having sat next to him, as Bailey ended up volunteering to stay with Balok as the first representative of the United Federation of Planets to the First Federation. Sulu was included in a five-man landing party that conducted a survey mission on planet Alfa 177. While there, he grew fond of a dog-like animal. Due to the Enterprise's transporter malfunctioning (which killed the creature), however, he, Leslie, and two other technicians had to stay a long while on the planet's surface, where they almost froze to death. Once the transporter was eventually repaired, Sulu and the three others were beamed safely back to the ship, with just some frostbite that was easily treated by Doctor McCoy. A particularly bizarre experience Sulu had to face early in his time as the Enterprise's chief helmsman happened when he wasn't even on the bridge. One day, Sulu was working on his hobby of botany in the ship's botany section when Yeoman Janice Rand came in with a tray of a food for the lieutenant, followed by a bizarrely acting crewman, Green. Sulu became puzzled by the crewman's arrival causing a frenzied reaction in a carnivorous plant, whom he called Gertrude, whose response prompted Green to quickly exit. Sulu, along with Rand, subsequently discovered the reason that the plant had acted the way it had, when they found Barnhart dead in a corridor with blotches on his face and all the salt drained out of his body; it turned out the version of Green they had seen earlier was a shape-shifting M-113 creature, which was killed a short time later. Some time shortly after the Spring of 2267, the Enterprise acquired a new chief navigator after having several that either had left due to other assignments or health reasons. That new chief navigator was young Ensign Pavel Chekov. Chekov also took over the duty of tactical officer from Sulu. The two became lifelong friends. Sulu would first take temporary command when Kirk and Spock were on the planet Organia and the Enterprise nearly went to battle with the Klingons. But the real non-corporeal Organians weren't going to allow a battle and immobilized both sides' forces causing on the Enterprise that all consoles and people became too hot to touch—including the captain's chair that Sulu was sitting in. When the being Apollo jammed all power sources on the Enterprise, Sulu was able to rig all transmission circuits for maximum power generation. This would eventually lead the ship to be allowed to destroy, with phasers, Apollo's strange radiated power source, his temple, which broke the ship free of his hold on them. Sulu was on the Enterprise at the helm when the ship encounter the planet killer and was thrown into a different quantum reality and the year 2379.